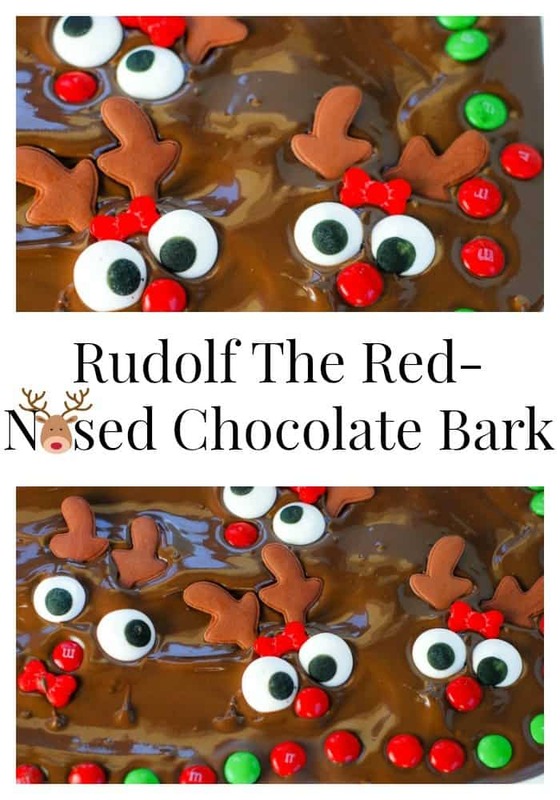 Rudolf the Red-Nosed Chocolate Bark had a very shiny nose . . .
A couple of weeks ago, as our Sunday lunch was coming to an end, one of the grandkids asked, “What’s for dessert?” I let them know that they were helping me make dessert as soon as the kitchen was cleaned. I didn’t realize what a great incentive that statement would be to get the dishes done in a hurry. Actually, the men did the dishes! I admit that I almost fainted. 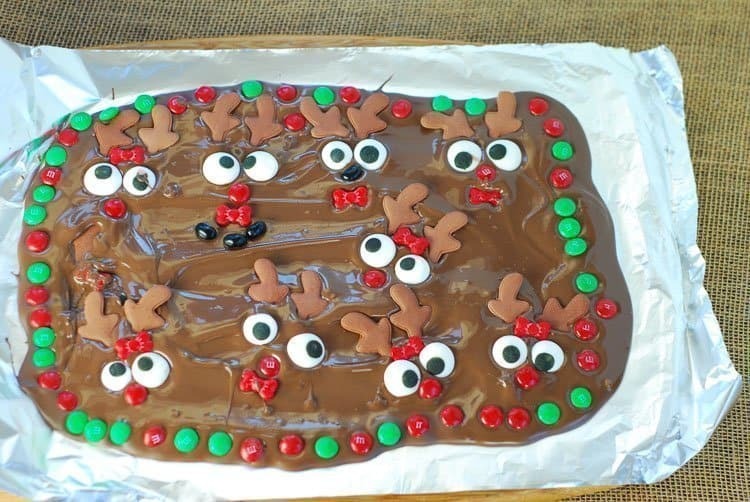 While the kitchen was being cleaned, I explained to the grandkids that we were making Rudolf the Red-Nosed Chocolate Bark. The little ones cocked their heads and looked at me as if I had lost my mind. They didn’t get the chocolate bark part. The next to the oldest perked right up because he’s the little chef-in-the-making. He’s cooked entire meals all by himself! I do believe the oldest, 11-years-old-going-on-30 rolled his eyes on the way to the great room to watch football. A few days ago when I was in Walmart shopping for I don’t remember what, I had a random thought to make little reindeer faces in chocolate bark. I grabbed some chocolate bark (they were out of Candiquik), pretzels (for antlers) and red M&M’s for Rudolf’s nose. As I was looking for eyes, I found the cutest little candy kit by Wilton. It had the antlers, eyes, and bowties/hairbows packaged up together. So I grabbed a box. 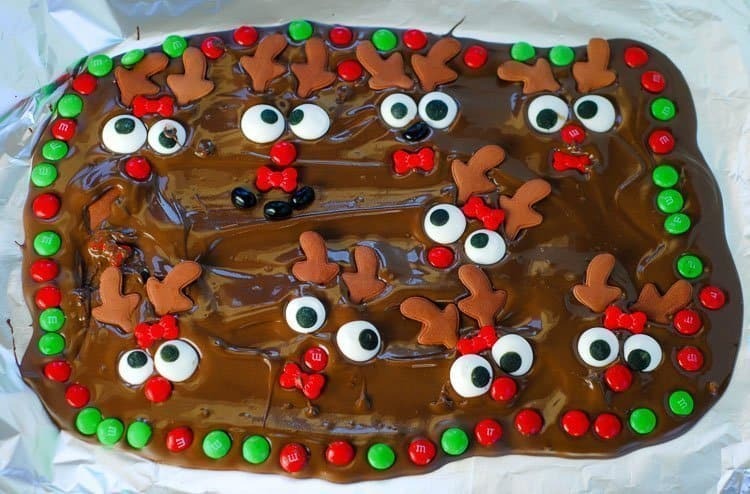 Then I let them make little Rudolf’s all over the chocolate bark. Of course, they (and I) sneaked a few M&M’s as they worked. The hardest part was letting their masterpiece harden enough so that they could eat it. Melt chocolate bark in the microwave according to package directions. Let cool for a minute or two and pour onto a sheet of aluminum foil, parchment paper or wax paper. Add the M&M's and other candies to make Rudolf faces. Let harden before breaking into individual faces and eating. This was a simple and fun project and the kids loved eating their masterpiece. The adults were not that crazy about the taste of the Wilton candy reindeer parts. Remember those candy cigarettes? That’s how they tasted to me. But the kids loved them. I kept a little of the candy bark to myself and folded in pretzels and M&M’s. Yes, the adults were happy! It’s so much fun to make holiday memories with the kids! We’ve made gingerbread houses and other fun projects, too. Do you have a special holiday project that you do with your kids? 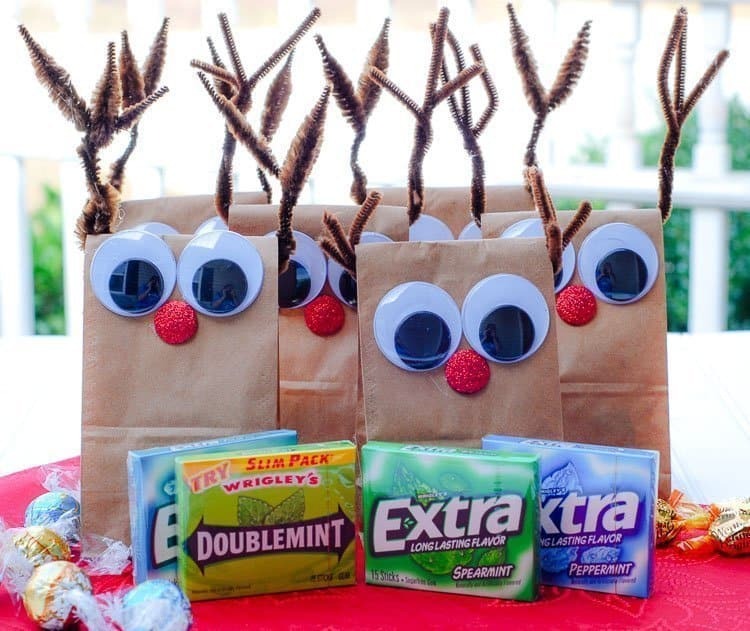 Psst: If you missed my Reindeer Treat Bags, you can find them here! What a simple but fun project to do with the kids, I want to try this out myself because I love chocolate too much. Never heard of a candy cigarette! Cookies are my favorite to make with them. In fact, I have a post up today on that, too. But I am glad the kids had fun and made memories with you in the kitchen. Isn’t that the greatest – and how simple it is to make kids happy? And by the way, what a great incentive to get the men to clean the kitchen! Your grands are way too cute!! This is super cute! My son is finally getting to the stage where he can participate in crafts and fun stuff like that. I am definitely putting this on our list of must make goodies. That looks beyond yummy and fun to make! I can’t wait until I’m home for Christmas and have a big kitchen to cook these in! I would faint too if any men in my house did the dishes! 😉 What a cute holiday idea! I made a topping over my brownies that hardens and kind of uses the same ingredients. I want to give this a try! That is such a cute idea. It’s so easy too. My kids love to make desserts, they’ll love this one. This is absolutely precious!!! I never would have thought to take it as it and cut it after everyone has seen how cute it is! 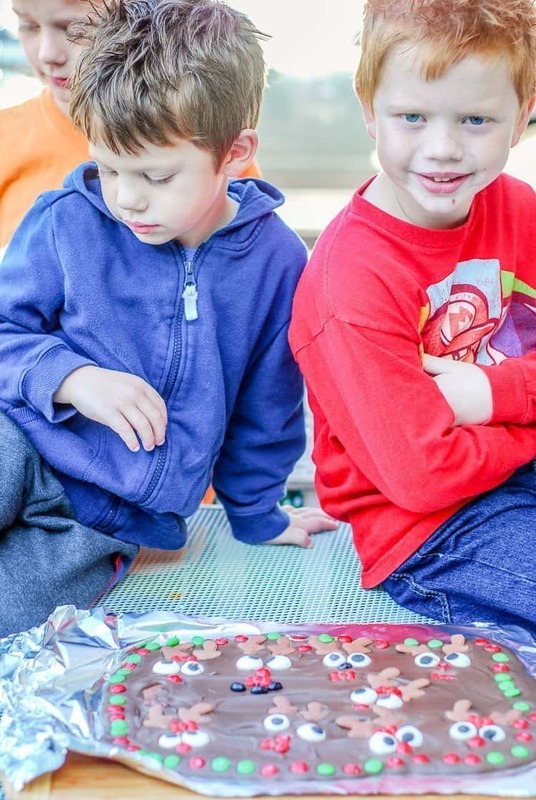 I guess we do that with cakes, so why not chocolate bark! Great idea! What an adorable idea. I love this. And my kids would love this. 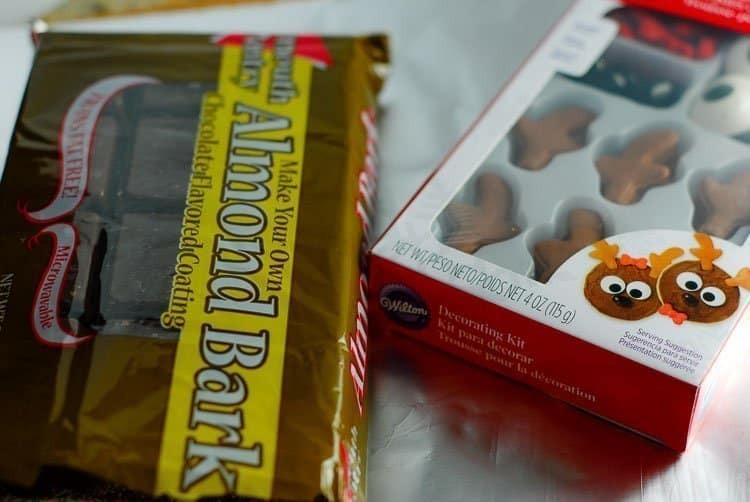 This would be perfect Christmas treats for kids and even kids at heart on Christmas. Rudolph is just a well loved character. This is absolutely adorable! And I just bought that rudolph candy decorations! We must make this! What a fun and creative recipe to make with kids for the holidays. My kids would love making something like this. Looks like hours of fun. This is such a great idea!! But I have to ask…how do kids feel when Rudolph is broken up?? LOL!! It looks like Rudolf and friends melted lol It’s almost (almost) too cute to eat! What a wonderful dessert. Looks like something our kids would love. Thanks for string this with us, so great! This would be so fun to make with the kids. I bet they’d love to take it to school for a snack to share with their friends. That turned out darling! How fun and creative 🙂 This would make a simple neighbor gift. I didn’t know they sold the little Reindeer kits like that.